Updated 2019 Nissan Maxima on Its Way to L.A.
an updated nissan maxima is on the way. last redesigned for the 2016 model year, nissan's upscale sedan looks to get a significant refresh for 2019. full details will come during the 2018 los angeles auto show in november, but nissan released an image today of the car's front quarter. the maxima's v-motion grille appears a little deeper and more angular than on the 2016-18 car, though it stops well short of the redesigned 2019 altima's ground-to-hood style. the outboard foglights sit in taller portals, while the headlights carry the 2016-18 shape but overhauled elements within, with elongated piped lighting under a string of jewel-like headlights similar to what acura does. the front bumper no longer encloses the bottom grille opening; a separate unit now forms the lower boundary. of course, it's hard to say how much of this — particularly the headlight design — comes courtesy of any sport package or particular trim level; nissan didn't reveal what particular maxima variant its image shows. the sedan's cut lines appear unchanged, as does the floating roof appearance courtesy of blacked-out window pillars. the automaker says the maxima will offer nissan safety shield 360 technology, a package of advanced safety features. on the 2019 altima and rogue, safety shield 360 constitutes automatic high-beam assist, blind spot warning, forward collision warning with automatic emergency braking, lane departure warning, rear cross-traffic alert and rear automatic braking. 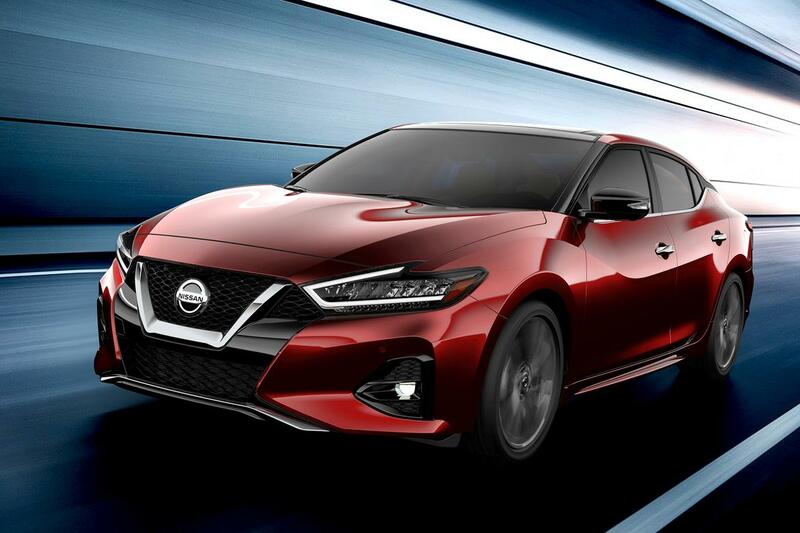 nissan announced in september plans to include the package as standard equipment on all top-selling models by 2021.
stay tuned for more details on the 2019 nissan maxima as we get closer to the 2018 los angeles auto show.